When it comes to getting organized, a business must have expertise. A business must keep up with finances and inventory. The Inventory Excel Sheet is a template created by Microsoft to help businesses keep track of their inventory. Next, fill in the name of the item in the consecutive row. Next, fill in the row marked “Unit Price.” This row is where you put the cost of that individual item. Fill in the “Quantity in Stock” section afterwards. The “Inventory Value” row is next to fill out. Finally, fill in the reorder level of this item and repeat all above steps for the rest of the items in the inventory. In the row to the left of the “Inventory ID” row you can mark an item with a flag. This can indicate that item to be most needed, most important, etc. In each row at the top you will notice a small box with an arrow in it. You can use this to set your inventory list in a specific order. For example, if you want to find out which item has the greatest or least inventory value, click on the boxed arrow in the “Inventory Value” spot. You can also cross out items in your list rather than delete them. This is good if the item is temporarily out of stock or temporarily not needed. In the description section, you can put down how often you use or need that item. You can also just simply describe what the item looks like if more than one item looks or works similarly to each other. The Inventory Excel Sheet is customizable, easy to use, and free to download on this page. 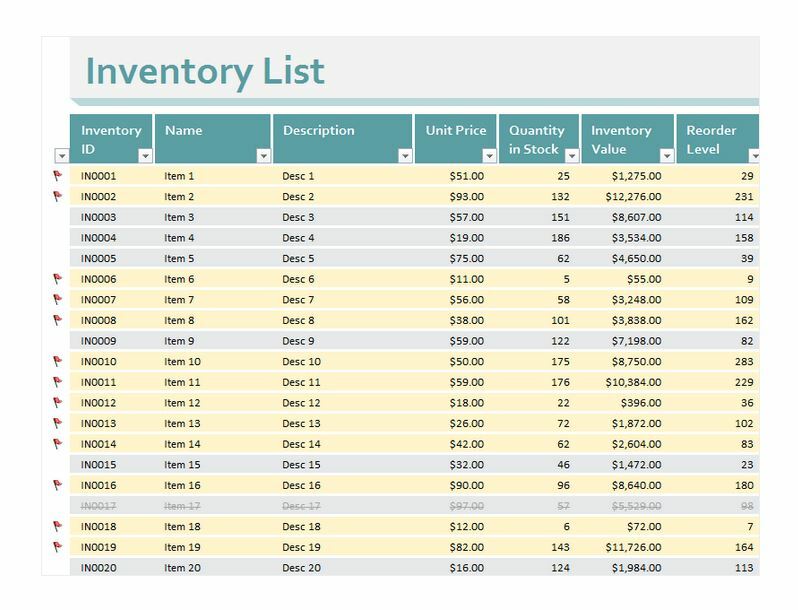 Stay organized and caught up with the Inventory Excel Sheet from Microsoft.